No matter where you live, the size of your department, its staffing levels, or how your standard operating procedures/guidelines are written, one task that all fire departments are expected to perform at every fire is deploying and operating handlines. 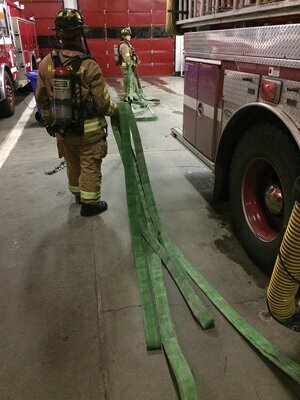 To facilitate getting the handlines in place and in operation, departments will often use a preconnected hose load. The methods of packing preconnected hose loads are numerous and range in complexity. One of the most commonly used and often misunderstood preconnected hose loads is the flat load. One of the largest benefits of a properly loaded flat load is the number of deployment options it offers. The flat load is a drag load designed to be stretched from either side of the apparatus by the crosslay. By properly placing two sets of pulling loops on each side of the apparatus with the nozzle in the middle, you have the option of which side of the apparatus from which to pull the hose, depending on the situation. Also, by having two sets of pulling loops on each side, one or two firefighters can easily deploy this hose load, depending on the situation. You can straighten out the flat load for long stretches or easily pull it for short stretches by dropping loops prior to the line pulling tight. Attach the female end of the hose to the appropriate discharge. Begin laying the hose flat into the hosebed. Keep alternating the stacks of the hosebed so that the two stacks are loaded evenly. When one-third of the total amount of hose is loaded, make an eight-inch loop in the hose, which will hang over the outside of the hosebed. Be sure to make four loops-two on each side of the crosslay and one on each stack (unless loading the hose on the rear of the apparatus; then you will need only two loops). This enables you to pull the crosslay from either side of the apparatus. These loops will be used as pulling handles. Continue to flat load the hose as before. 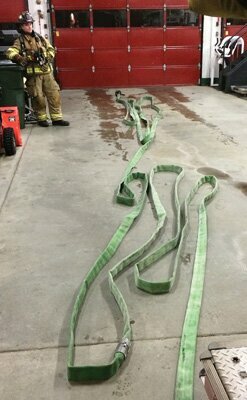 When you have loaded two-thirds of the total amount of hose, make two loops on each side of the crosslay. These loops need to be of sufficient length to allow a firefighter to reach through the loops as needed. Finish flat loading the remainder of the hose. Attach the appropriate nozzle and place the nozzle on top of the crosslay in the middle of the hose load. If loading on the rear of the apparatus, place the nozzle on top of the hose load near the rear of the stack so that it is readily accessible. If you are loading the flat load on a single-wide hosebed, use the same steps except when alternating stacks while loading the hose; instead, you should load the hose on top of itself in a single stack. 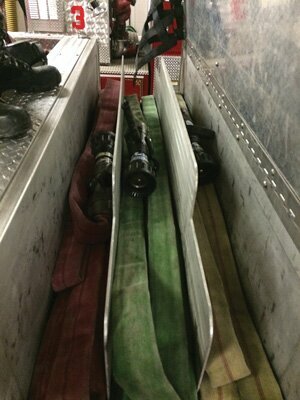 Since it is a drag load, at no time during the advancement should you place the hose on the firefighter’s shoulder. By keeping the hose on the ground during the stretch, the firefighter’s center of gravity is not raised the way it sometimes is with other hose loads; this makes for a safer stretch. By dragging the hose, the firefighter can stop and start the stretch as needed. Simply placing the loops and nozzle on the ground allows for the completion of another task. You can start this stretch again by picking up the pulling loops and nozzle, and continuing. Another advantage of a properly deployed flat load is that the line is already flaked in the proper position, in line with the entry point. When completed, place the nozzles in the middle of the stack. Because the flat load can be pulled from either side of the apparatus, make sure to stay consistent in placing the nozzles in the middle so that the firefighters can easily find them and control them as the line is deployed. One common mistake is to serpentine the hose at a 90° angle just before reaching the front door. By doing this, you create pinch points along the bottom of the doorframe as you stretch the line into the building. 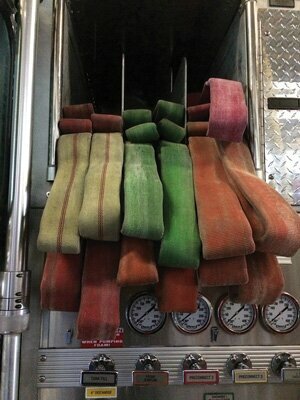 Keeping the hose lined up with the doorway will ensure an easier advancement. When properly deployed, the first coupling should also be near the door. This ensures that at least 50 feet of line is ready for advancing. Place one arm through the top loop. Reach through the loop and grasp onto the bottom loop with your hand. Grasp the nozzle with the opposite hand. Walk away from the apparatus. At no time should you place the hose on your shoulder. As the load deploys, drop the bottom loop once it pulls taut. Continue deploying line, dropping only the loop when it becomes taut. Extend and flake out the remaining hose. When deploying with two firefighters, the first firefighter reaches through the top two pulling loops and walks away from the apparatus, allowing the hose to be dragged behind them. The firefighter needs to control the nozzle with his opposite hand as he pulls out the line. Place one arm through one of the top pull loops. Reach through and grasp the opposite-side lower pull loop. Continue deploying line, dropping only the loops when they become taut. The first firefighter places one arm through one of the top loops and grabs onto the second top loop. He grasps the nozzle with his opposite hand and pulls the load from the bed while walking away from the apparatus. At no time should this load be placed on his shoulder. The second firefighter reaches through a bottom loop and grabs onto the second bottom loop. The second firefighter then walks away from the apparatus. At no time should this load be placed on his shoulder. As the load deploys, drop only those loops that become taut. Once completed, the hose should be flaked in line with the doorway. Flaking the hose in the direction of travel will avoid creating additional pinch points at the bottom of the entry point, making for a quicker stretch into the structure. Like all types of preconnects, the flat load also has a disadvantage: cornering. Remember, you will have approximately six to eight feet of looped hose dragging behind you. When approaching a corner, you will need to “go wide” to allow the hose to be pulled around the corner without becoming stuck. Exercise special caution when dragging hose between vehicles. Car tires make for stubborn pinch points; they are especially capable of grabbing onto the hose or coupling and trapping it between the tire and the road. Regardless of what type of preconnects your department uses, all firefighters require continued training on loading and deploying. Keep training and keep stretching lines. Getting water on the fire will make all the problems go away. ADAM IVERSON is a lieutenant with the Manchester (NH) Fire Department. He has an associate degree in fire science and a bachelor’s degree in fire service management. Iverson is an EMT-Intermediate and an instructor with the New Hampshire State Fire Academy.